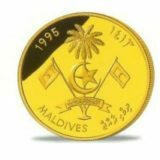 Obverse: A canvas with painted face value of the coin and year of coinage is placed in the center of the coin. The upper part has trade mark of Kazakhstan Mint. 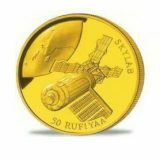 The metal its fineness and weight “Ag 925 31,1 gr.” is indicated in the lower part. 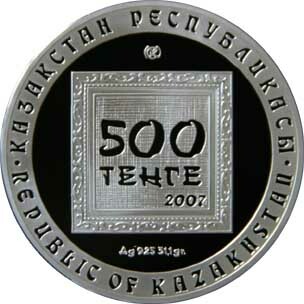 Along the perimeter of the coin wide edging includes legends “REPUBLIC OF KAZAKHSTAN” in Kazakh and English divided by dots. 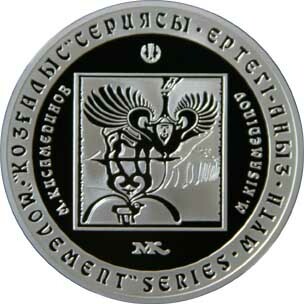 Reverse: Myth, a picture of M. Kisamedinov is places in the center. Under this picture there is facsimile the painter, his name is indicated to the left and to the right of the picture. 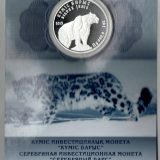 Along the perimeter of the coin wide edging includes legends “MOVEMENT SERIES • MYTH” in Kazakh and English divided by dots.